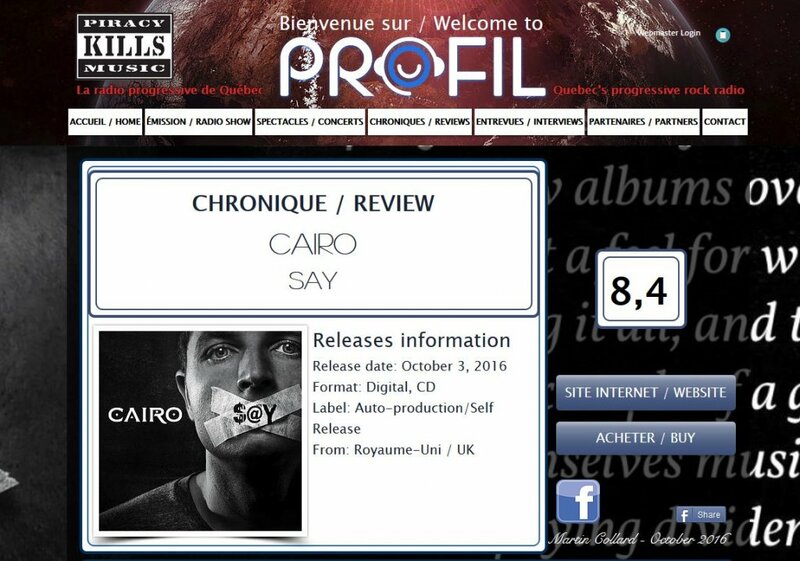 Fantastic review from Quebec’s PROFILPROG.com sites the song ‘Say’ as a “smash hit”; advises “everything is excellent” and recommends the album as a ‘buy’ to all. The review is in French, being the main language in Quebec, and a web translation is attached. The album “Say” from CAIRO group is the first album from this band and is led by keyboardist Rob COTTINGHAM. After working in a band called Cinema in the early 90s, ROB form a group of the Ghost name (which has nothing to do with the Ghost BC group we know today) and more recently Touchstone, perhaps the best known of all. With CAIRO, not to be confused with the American band of the same name. Rob wants to stay in the progressive movement, but with a heavier and a more electronic environment, while partnering with a female voice. After sharing the microphone with Heather Findlay on his second solo album ( “Captain Blue ‘, 2013), where he had also asked for a guitar solo Steve HACKETT, and Gary O’Toole (Steve Hackett) was involved – Rachel Hill he chose for this album – she was the singer of the group Nanburn. The CAIRO album production is worth listening to in it’s own right. With influences that sometimes recall Pink Floyd 80s and 90s, the atmosphere of the album takes off in a more rhythmic and then slows with softer parts. The hit of the album for me is the “Say” title that is excellent – well rocking. Rob and Rachel share the vocals on the album. The music is very melodious; very captivating voices. For prog fans who like a more relaxed side than excited you will be served well. The first two parts serve as an introduction to the album. Then comes “Shadow’s Return” and the smash hit “Say ‘that are both catchy parts. “Katrina” and “Searching” are two ballads like Pink Floyd. The rest of the album has a final semi-ballad:.techno vibe..
Basically, this is a good album in it’s own right. They have not reinvented the wheel but instrumentation, production, the rhythm of the songs, the different voice of the two singers, everything is excellent.